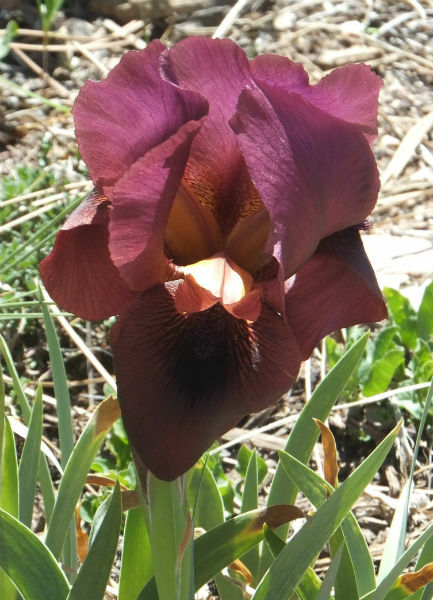 There is a very interesting line of irises created by Harald Mathes of Germany, beginning with 'Anacrusis' (Mathes, 1992). 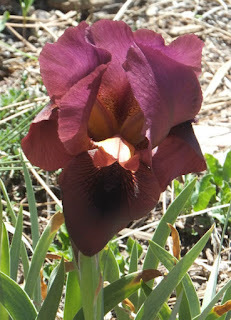 This iris was produced in a very interesting way. Mathes crossed a pure oncocyclus aril hybrid (I. iberica x I. auranitica) with the dwarf bearded species I. suaveolens. Both the aril and the dwarf are diploids (two sets of chromosomes), and wide crosses between diploids ordinarily produce sterile offspring. Mathes, however, used colchicine treatment to convert the seedling to tetraploidy (four sets of chromosomes). Theory predicts that such a tetraploid would be fertile, and indeed it was! (See my earlier blog post, Tetraploid Arils, Anyone?) Tetraploids created in this way can be unstable, reverting to the diploid state or growing poorly or erratically. So to preserve this breeding accomplishment, Mathes used the pollen of the tetraploid seedling on a conventional arilbred, 'Dresden Gold' (Foster, 1975). The result of that cross was 'Anacrusis'. 'Anacrusis' thus carries an unusual complement of genetic material. It has two sets of aril chromosomes, one from the oncocyclus hybrid Mathes had used, and one from 'Dresden Gold'. It has one set of TB chromosomes from 'Dresden Gold', and one set of dwarf suaveolens chromosomes. So it is a "halfbred", with two sets of aril chromosomes and two sets of bearded chromosomes, but with an important difference: one of the bearded sets is from the dwarf species I. suaveolens, rather than the TB ancestry found in most halfbreds. The aril species I. auranitica is also something different, not to be found in the ancestry of most halfbreds. 'Anacrusis', the result of this unprecedented combination of genetic material, is an arilbred median (20 inches in height) with the globular oncocyclus flower form, dark color, and a large black signal. It is worthwhile to compare this with more typical arilbred medians, which come from crossing halfbreds with standard dwarf bearded irises (SDBs). These get their dwarf ancestry from I. pumila, whereas 'Anacrusis' gets its from I. suaveolens. Conventional arilbred medians are one-quarter aril, but 'Anacrusis' is one-half aril. And finally, conventional arilbred medians are sterile, but 'Anacrusis' is fully fertile, just like tall halfbreds are. But what to cross it with? The first 'Anacrusis' child to be introduced was 'Invention' (Mathes, 1994), the result of crossing 'Anacrusis' with a sibling. 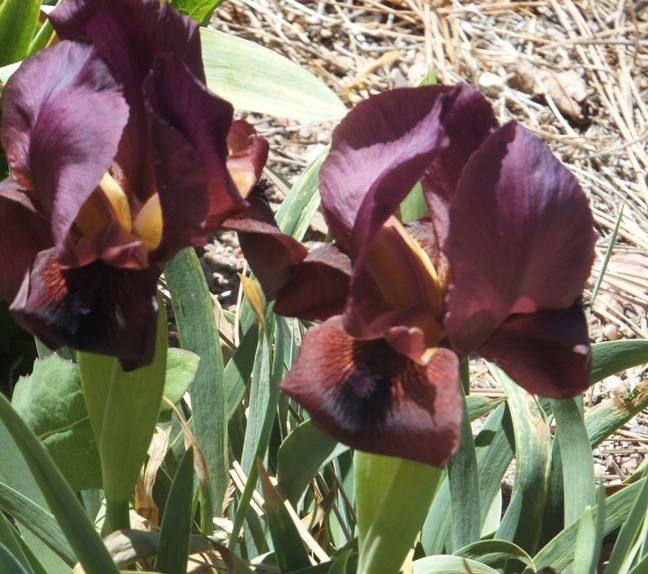 This iris is similar to 'Anacrusis', also 20 inches in height, and with a similar dark color. The next avenue to explore was combining 'Anacrusis' with other arilbreds. To this end, Mathes made use of one of his other unusual arilbreds, 'Gelee Royale' (Mathes, 1982). 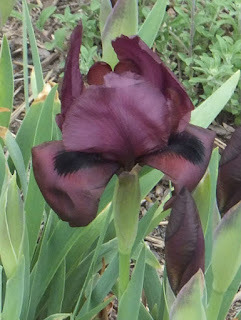 This iris is that most unusual of creatures, a pentaploid (five sets of chromosomes)! Its pod parent was an triploid OGB+ arilbred (2/3 aril complement, with the aril sets coming from I. auranitica and the Regelia I. hoogiana), with 'Dresden Gold' again as the pod parent. Although this is a complicated pedigree, 'Gelee Royale' breeds much like other halfbreds do. Mathes crossed 'Gelee Royale' with its sibling, crossed the result with the 'Anacrusis' sibling, and then finally crossed the result to 'Invention'. The result of this multi-generation hybridizing work was 'Concerto Grosso' (Mathes, 1998). Despite the presence of 'Gelee Royale' (registered at 35.5 inches) in its pedigree, 'Concerto Grosso' is still only 20 inches tall itslef. 'Concerto Grosso' has larger flowers than 'Anacrusis' and 'Invention', and is a rich mahogany color, quite different from most arilbreds. It went on to with the C. G. White medal, the highest award for arilbreds, in 2005. Mathes had not finished his work with this line, however. 'Anacrusis', 'Invention', and 'Concerto Grosso' are all very dark in color, and Mathes wanted to extend the range of this line to lighter hues. 'Iridescent Orange' (Mathes, 2001) from ('Invention' x 'Gelee Royale') X 'Concerto Grosso' is a lovely orange self with a dark signal. At 23 inches in height, it is just above the limit for the arilbred median category, as defined in the Checklist of Arilbred Dwarfs and Medians. Its sibling, 'Suprassing Yellow' (Mathes, 2001) is a yellow rendition of the theme, also 23 inches. The line is carried on in 'Glittering Garnets' (Donald Eaves by Elm Jensen, 2010) is from 'Anacrusis' crossed with the arilbred 'Desert Plum'. This is 22 inches in height, at the upper limit of the arilbred median category. These irises have also been used in crosses outside the halfbred fertile family to which they belong. 'Dotted Sunsuit' (Mathes, 2001), is an OGB+ triploid from a yellow 'Anacrusis' sib crossed with an oncogelia seedling. 'Chain Reaction' (Tasco, 2007) comes from an SDB seedling x 'Concerto Grosso', a small arilbred median at 13 inches. 'Arcanum' (Jensen, 2013) is from 'Anacrusis' x I. pumila 'Crouching Tiger', a diminutive arilbred dwarf at only 6 inches in height! There is still potential to be tapped from the 'Anacrusis' legacy. Its value in breeding fertile arilbred medians should be noticed and pursued. The most promising way to go about this is to cross 'Anacrusis' or any of its descendants with the smallest halfbreds available. 'Peresh' (Whitely, 2001), at 15 inches, and its siblings 'Eglon', 'Kedesh', and 'Tekoah' come to mind. 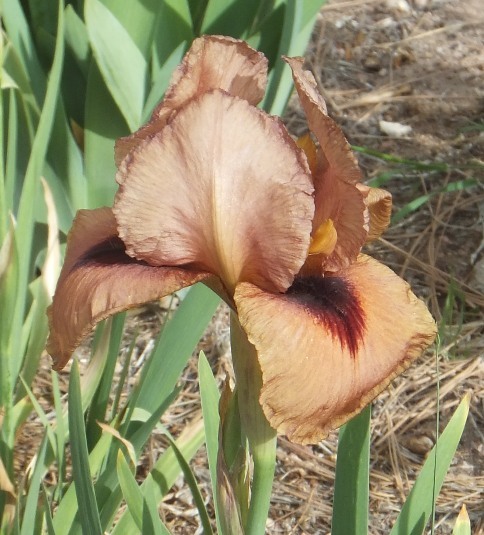 The creative, unprecedented cross that produced 'Anacrusis' is a true hybridizing success story, not only producing an interesting, attractive iris, but opening up new paths for the hybridizer and for others who were to follow.